Save Time. Reduce OpEx. Increase NOI. Ambitious companies are leveraging Jack's artificial intelligence (AI) to improve efficiency, increase tenant retention, and boost lead conversion while reducing operating expenses. Manage time, processes, and tasks more efficiently. Jack captures your prospect leads and follows up instanlty. No more waiting. Our AI-powered bot does the scheduling, your agents do the showings. 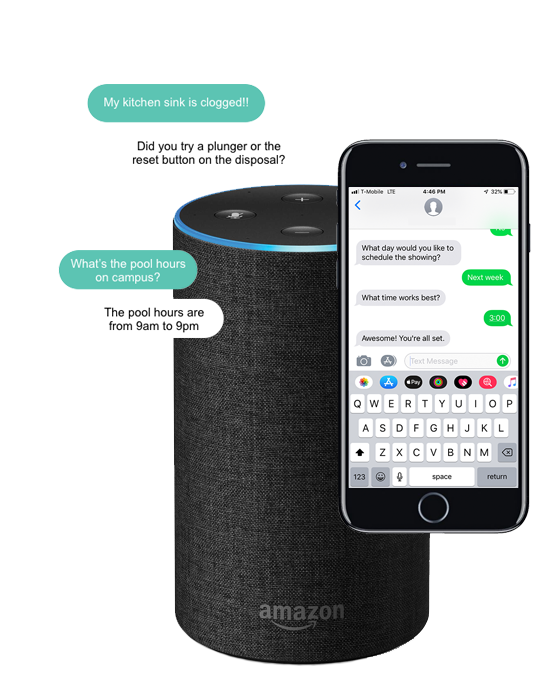 Provide tenants instant responses via the world’s most popular channels they use every day including Amazon Alexa, Messenger, Text Messaging, and more! Automate up to 70% of all prospect and tenant engagement without changing your current software. Automate the boring. Do the productive. Jack works 24/7 and never takes breaks, sick days, or vacations. Jack helps your agents save hours each day on communication. Not another platform. We sync and leverage your existing systems. Jack puts a blue collar on AI and lets it manage repetitive, high-volume tasks and workflows, leaving the complex inquiries to your agents. Ready to cut costs, get back time, and supercharge your team? © 2019 Jack Automation Technologies, Inc.